For decades, Old Lahaina Luau has been known for its authenticity and respect for culture through forms of native dance. But those same values can be applied to its food. Hoaloha Farms provides its parent restaurant company, Na Hoaloha ‘Ekolu, with a bounty of fresh local pork and produce, including many varieties of taro or “kalo." Na Hoaloha ‘Ekolu encompasses the award-winning Star Noodle, Old Lāhainā Lū’au and Aloha Mixed Plate in Lāhainā, along with Leoda’s Kitchen & Pie Shop in Olowalu. 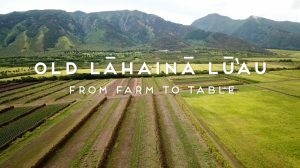 In this Business Spotlight feature, we get a virtual tour of Hoaloha Farms with manager Bobby Pahia, as he shares farm-to-table at its finest.